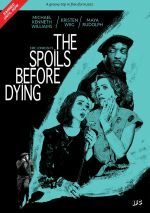 An IFC miniseries, The Spoils Before Dying presents a comedic take on film noir. This DVD includes all six episodes, which I�ll view in broadcast order. The plot synopses come from the IFC website. Dying acts as a �sequel� of sorts to 2014�s The Spoils of Babylon, but they really only share two clear elements: their �creation� by Jonrosh, and their existence as parodies. Babylon went after 1970s/1980s �epic� mini-series and not the 1940s/50s film noirs seen here, so they target different genres � though with a handful of actors in common. Parody is a delicate genre, but after one episode, I like what I see from Dying. Ferrell�s take on Jonrosh as a blustery late-life Orson Wells entertains, and the episode mixes cheesy production values with intentionally bad dialogue in a likable manner. I don�t know how well Dying will sustain interest across another 100-plus minutes, but I�m happy so far. Given his background in more serious projects like Boardwalk Empire, Williams seemed like an unusual choice for a spoof like this. However, he turns out to be one of the miniseries� best elements, as he does well in the role. Williams offers a light comedic touch that avoids over-acting, and he helps keep the show interesting. As noted, Williams� performance works because he plays things relatively straight. Other castmembers fly all over the place, and that leads to some over the top work. Wiig filled that niche in prior shows, and Kate McKinnon goes too goofy here. I�m not sure why those two opt for such broad comedy, but it doesn�t work. A few new actors add some zest, though. Sheen gives his character a good tone, and Chris Parnell brings pep to an impresario. Overall, �Jazz� continues the series on a fairly solid path. More than halfway through the miniseries, I feared Spoils would start to fade, bur �Fear� benefits from two elements. First, the return of Chin Han�s �Mexican� enforcer offers a brief delight, and Peter Coyote�s voiceover as a talking cat brings us a trippy interlude. A few bits misfire, but �Fear� keeps us pretty engaged. �Trap� feels a little looser than usual, partly because the drug trip that informs the show�s title goes on too long. A few other elements feel a bit too on the nose as well. Still, the episode comes with a few laughs, so it�s a decent entry. Spoils comes to an end with a moderately satisfying finale. Truthfully, there�s no good way to finish the series, as the story made so little sense that the actual �climax� didn�t matter. While �Eaters� does provide a proper conclusion, the action and character elements feel irrelevant. Nonetheless, �Eaters� does deliver an enjoyable enough end to a decent parody. Spoils never threatens to turn into anything sizzling or hilarious, but it brings us general amusement across its two hours. The Spoils Before Dying appears in an aspect ratio of approximately 2.40:1 on this single-sided, double-layered DVD; the image has been enhanced for 16X9 televisions. I thought this became a more than adequate SD-DVD presentation. Sharpness was generally fine. For the most part, the shows offered reasonable clarity, but they could veer a bit soft at times. Minor instances of jaggies and shimmering occurred, but edge haloes failed to appear. No source flaws materialized � no unintentional problems, that is, as the project occasionally added �defects� from time to time. In terms of palette, the series opted for fairly subdued tones, with some orientation toward teal and orange. These came across as pretty solid, though they lacked much vivacity. Blacks were moderately dark, and low-light shots came across as acceptably smooth. The episodes never excelled but they looked reasonably good. As for the miniseries� Dolby Digital 5.1 soundtrack, it came with moderate ambition. Music showed pretty good stereo presence but the soundscape was up and down overall. A few episodes came with some pizzazz � especially during drug-related sequences - but most of the effects come across as fairly limited. Audio quality was positive. Speech became the most important factor, and the lines sounded natural and distinctive. Music was bright and peppy, and effects came across as reasonably accurate. Nothing notable came with the audio, but the sound was acceptable for the minieries. As a parody of film noir, The Spoils Before Dying works reasonably well. While the miniseries never fires on all cylinders, it creates a fairly amusing experience. The DVD provides mostly good picture and audio but comes without any supplements. Fans of the actors involved should enjoy the show.